I love these books so very much. It is so mind-bogglingly cool to me that I can now count Lawrence Watt-Evans among my friends. I want to re-read these, as they’re some of the very few books that I loved well enough as a teen to hold on to for all these years and through all the moves. Apparently she’s re-released them as e-books! I may be the only person who’s actually read all five of these. A lot of people over on Twitter had read one or two, but it took a really long time for all of them to come out, and I was unusually determined about them. 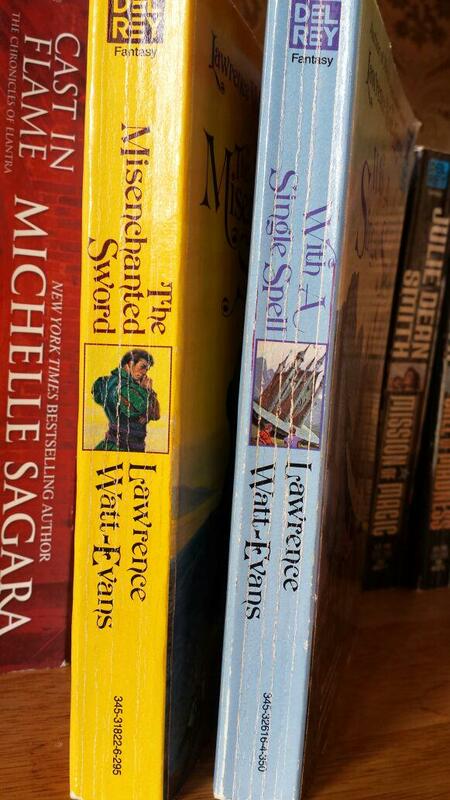 I want to re-read these, too. 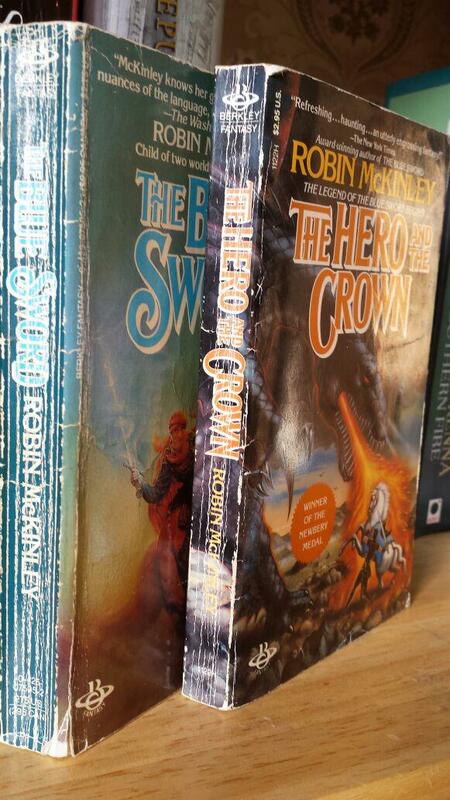 My dog-eared, sweat-stained, beloved BLUE SWORD and HERO AND THE CROWN. I have them in hardcover now, but I’ll never let these two go. Someday I hope to get Robin McKinley to sign them. 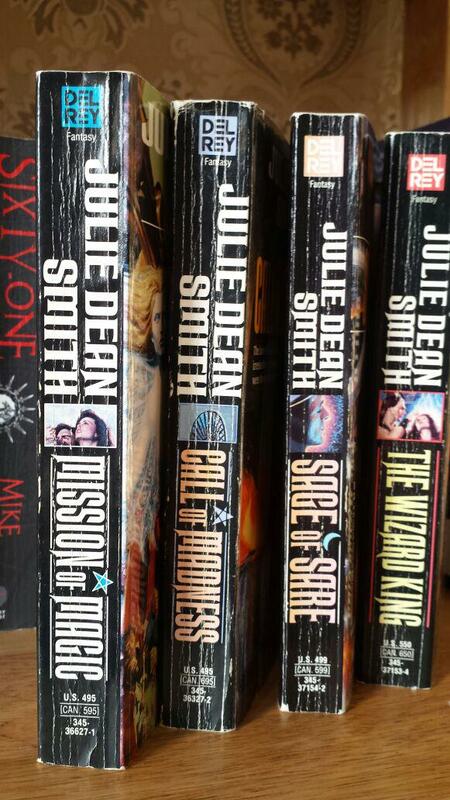 My equally beloved SECRET COUNTRY trilogy, which I’ve read more times than I can possibly count. 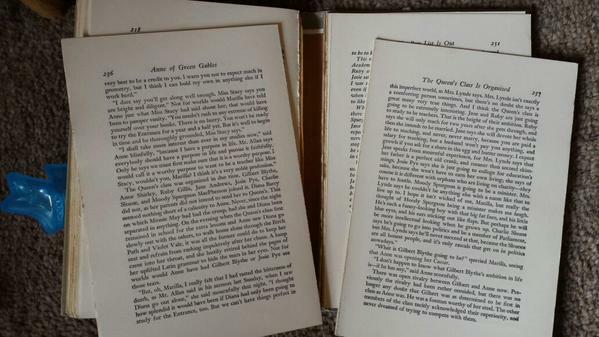 I’d replace these in hardback, too, if I could, because I live in fear of the day they fall apart. And I will get them signed somedaay, dammit! 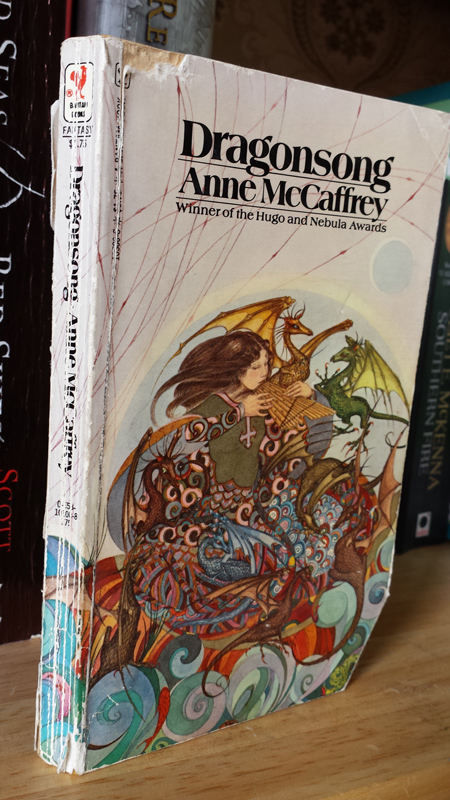 I think my copy of DRAGONSINGER must have fallen completely apart, and I just flat-out don't know what happened to DRAGONDRUMS. 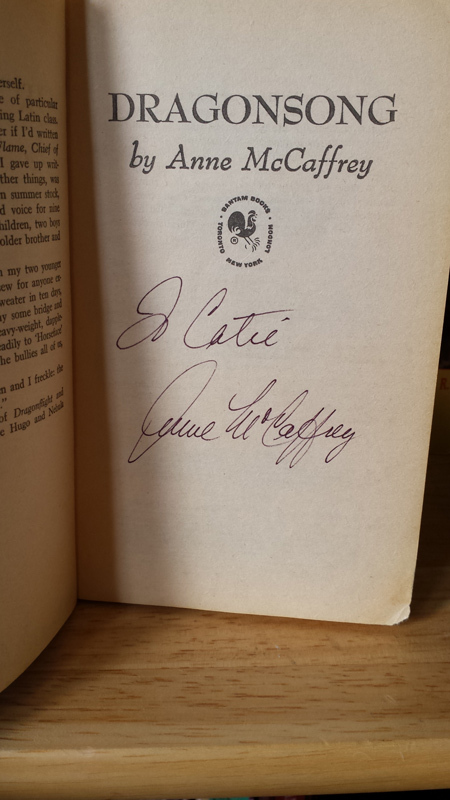 I should try to find matching copies, although since I can't get them signed, it's less of a thing. I had all of those. Don't know where they went to, alas. My equivalent of your Anne of Green Gables is The Good Medicine Book by Adolph Hungry Wolf. Others I have replaced, but that's one I can't, but I can't stop reading it. My complete Conan, complete Barsoom, and complete Mithgar series look as well loved as most of yours. I have most of the same books on my shelves, though my Robin McKinley of reread tends to be Beauty...I tend to snap up copies I see in used book stores of that one if they're in okay condition since I've read two to pieces. Same with "Forgotten Beasts of Eld" by Patricia McKillip. Oddly, I only read the first couple of Unicorn books too. I think you're right, it's because they took way too long to come out and I'd moved on to other things. I should see if I can find used copies. My ears are burning. :-) The publisher did cancel the book, but I'm going to self-publish it within the next year. It needs some tweaking and expanding, and connected stories ("Owlswater" and The Dubious Hills) need to be re-released as well. Unfortunately, last time I checked -- and I will continue checking -- the Secret Country trilogy is deemed to be still in print as long as it sells a certain number of copies of the e-book edition, which it is doing. The whole trilogy was re-released in 2003 in mass-market paperback editions with matching covers, from Firebird (a line from Viking/Penguin/NAL). As usual, it seems fairly easy to get the first two volumes, but the third is hard to come by, and I screwed up buying up all the remainders of the third book when the publisher offered me the chance, and couldn't really afford them anyway, so I'm not in a good position to provide them. I am hoping the e-book sales sink enough that I can maybe get the rights back and reissue the trilogy myself. It's bound to happen at some point. People who want to buy the e-books should totally do so, though. I hope this information is useful! And I wasn't sure our host knew about the new(ish) paperback edition either. Yay! Although I feel kind of bad because I actually had avoided asking you on your journal about it because I didn't want to be a pest about it ;-) I've been very excited to read it since the Secret Country books are some of my favorite comfort reads. Thankfully I realized when I was a late-ish teenager that I loved the books so mine are still in sort of good condition but I'll definitely keep an eye out for the other editions. You are really welcome to ask questions like that of me at any time. Such questions are very seldom pestiferous. It's nice, in a career that has ups and downs and sideways weird bits, to know that people are still interested. My editor (Sharyn November) actually consulted me about the covers. Nobody has EVER done that before. That's why there's a tiny cardinal on each one. This still makes me ridiculously happy. I have a hard time actually getting around to buying reissues too. There are so very many new books, and the old copies one has read and reread have such resonance. Be sure to have Catie post here when you finally put it out, please! with the exception of the Green Gables I have all those books and have read them. So many of these are my well-loved books too that I feel I must try to get hold of the ones I haven't read yet. Ah, the Unicorn books. I... believe I have read all of them, as all those titles looked correct! 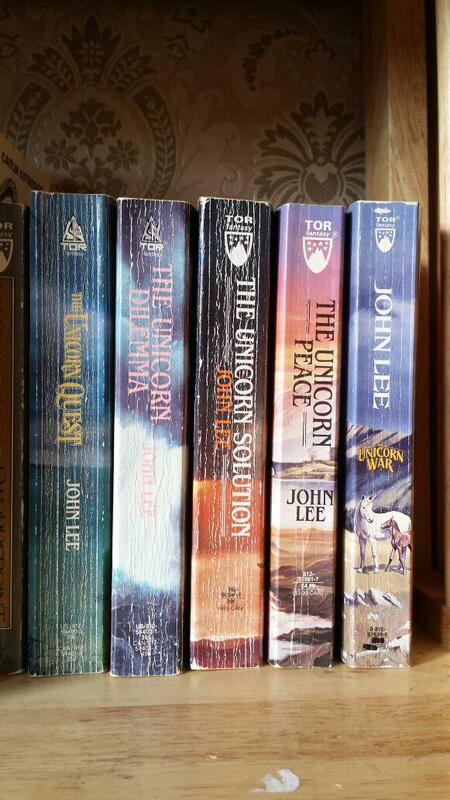 I've read all five of the Unicorn books by John Lee too. I was always so happy when a new one came out.